Today is the 501st. anniversary of the Protestant Reformation. Today is also Halloween. These two events are actually related. 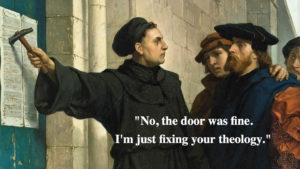 It’s not a coincidence that Martin Luther chose this day to release his “95 Theses”. He knew that many learned people would come to the Wittenberg Cathedral the next day to celebrate All Saints’ Day. In this document called the “95 Theses”, Luther put forth biblical arguments to counter the many false teachings, traditions and outright lies that had completely distorted the Christian faith after Jesus and the Apostles died. Baptism by sprinkling, the sale of indulgences, penance for sins and the immortality of the souls were some of the deceptions that entered the post-apostolic church. Pagan idols were disguised as saints and received worship. A man sat behind a confessional and claimed to have power to forgive sins. The Pope claimed to sit in the place of God on earth. All of these were idolatrous and blasphemous beliefs and practices that replaced idols and men for the one true living God. Martin Luther had sought God with all his heart, and found Him (Jeremiah 29:13). The Lord used Martin Luther in a mighty way to ignite the biggest revival since the outpouring of the Holy Spirit at Pentecost. The Protestant Reformation is a beautiful period in sacred history. We owe these brave men and women our access to Bibles and the unfiltered Word of God. Personally the fire in my heart is rekindled every time I read about their heroic stand for truth which in many cases ended in martyrdom. Yet every martyr only spread more seeds for the Reformation, for God’s honor and glory. I hope you’ll be inspired to listen to my two powerful podcasts on the Protestant Reformation: Truth Restored Part 1 andTruth Restored Part 2. 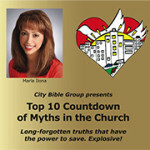 Also, if you haven’t listened to the “Top 10 Countdown of Myths in the Church”, now is the perfect time. 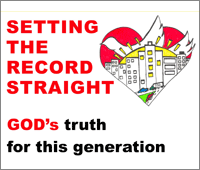 These two podcasts debunk the Top 10 lies that still remain in our contemporary Christian Church: Top 10 Countdown of Myths in the Church Part 1 and Part 2.